I am excited to welcome you to Accutrainee’s very first newsletter. I founded Accutrainee because I felt the training contract model needed improvement and I wanted to create opportunities for talented graduates in an ever increasing challenging and competitive market. Since 2012, I am very proud that we have successfully helped many trainees reach qualification and that clients have embraced the diversity and quality of our unique trainee solution. This has ultimately resulted in every one of our trainees receiving one or more job offers once qualified. Given our success and the demand for cost-effective flexible junior resourcing solutions, we are now in the process of expanding our offering to paralegals, regulatory analysts and newly qualified solicitors. You will find more about what we do, our candidates and the latest developments in trainee qualification routes in this first newsletter. Accutrainee offers a unique trainee resource solution by employing trainee solicitors and seconding them to clients for a period between six months to two years so that they can complete their training. We are SRA-authorised and responsible for ensuring training requirements are met or exceeded at all times. This creates opportunities for trainee solicitors and enables clients to work with trainees in a way they previously felt was not possible. More information about us and how we deliver value to our clients can be found in our client brochure. Who are our clients and how are we helping them? Our clients include law firms, corporates, financial services and regulatory consultants. Clients have found our innovative approach provides a cost-effective, flexible, outsourced solution to meet unforeseen spikes in workload and manage the challenging demands of the changing regulatory landscape. Clients also turn to us to help them develop an existing paralegal knowing we will take care of all regulatory requirements by taking on the role of the SRA-registered training establishment. More information about us and our success stories can be found at www.accutrainee.com. Quality and diversity are intrinsic to Accutrainee. We are extremely selective about the candidates we put forward to clients. Applicants are required to successfully complete our robust interview and assessment selection process giving quality assurance to the shortlists we prepare for clients. Here is a small selection of available candidates. AAAB at A-Level, 2:1 History at Edinburgh University, GDL Commendation and a Distinction in LPC. Significant experience in legal drafting and research. AAA at A-Level, 2:1 LLB at King’s College London; Commendation in LPC. Second-seat trainee with experience in magic-circle, US and city law firms, as well as in-house within a financial consultancy firm. 1:1 LLB at Baku State University Azerbaijan, 1:1 LLM in Civil and Commercial Law, Distinction in GDL and LPC. Experience in corporate, employment and contract law and international and EU law. Fluent in Russian with intermediate level Turkish. ABB at A-Level, 2:1 LLB at University of Essex; Bar Professional Training Course – very competent; Distinction in LPC. Third-seat trainee with considerable litigation experience having managed significant case-loads and accredited civil and commercial mediator. Good language skills. If you would like to review these or other candidate CVs, or you would like to discuss how we could help with your resourcing needs, then please contact us. You may be aware that the SRA is changing the way solicitors qualify. Candidates will need to pass an independent assessment called the Solicitors Qualifying Exam (SQE), which is due to be introduced in September 2020.The SQE is similar to the old Law Society Finals but the SRA insists it will be more extensive using written tests, multiple choice questions, role plays and mock client interviews. The new qualifying exam will be split into two parts (SQE part I and part 2). Part 1 focuses on legal knowledge and part 2 on practical legal skills. In between these exams, candidates will be required to complete two years’ qualifying work experience or essentially, their training contract. The SRA is heralding this qualification route as cheaper, less precarious for students, delivering more consistency at the point of entry to the profession, and facilitating greater diversity. There will be many different possible timelines for would-be solicitors dependent on the route taken, for example, whether a candidate is a law graduate or, for example, if the apprenticeship route is being used. 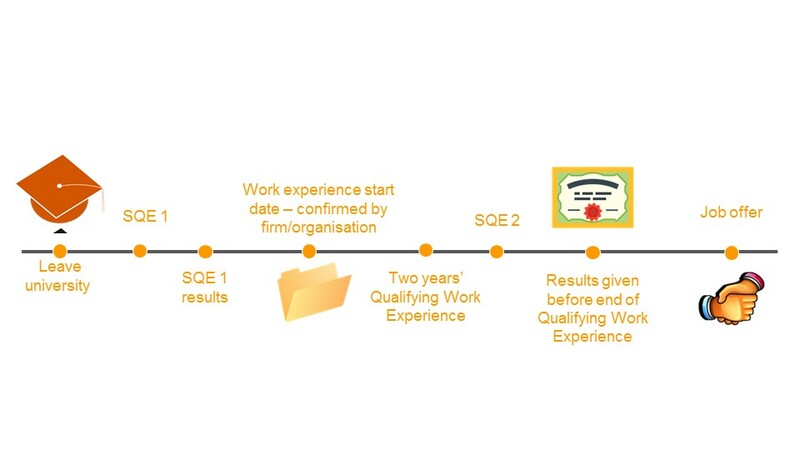 One possible timeline for sitting the two qualifying exams and completing work experience for a graduate is shown below. The SRA has been consulting with the legal industry on this new route to qualification and it’s safe to say that the SRA’s optimism is not matched by many in the profession. There is fear that the exam will ‘dumb down’ the qualification route, damage the profession’s reputation both nationally and internationally and not deliver the diversity and cost savings the SRA claims.The SQE will remain a degree-entry qualification and the minimum time required for work experience will be two years, criteria many lawyers had to fight for during consultation as the SRA was ready to remove both of these requirements. The exam will be national and centralised, which will introduce a level of consistency; this can only be a good thing, even if we don’t know what that level will be yet. If too low, we will have a qualification free-for-all; if too high, firms and graduates will be hit with additional exams and fees. We are still missing reams of operational detail and so we are currently at the “wait and see” stage. As an SRA-registered training establishment, Accutrainee has been observing and consulting on the proposed changes from the beginning. We have championed the benefits of wider work experience for years and it is at the heart of what we do. It is partly the reason why our trainees possess business acumen, broad experience and are ready to hit the ground running. However, with that we have introduced a far higher degree of monitoring, assurance of meeting standards and support for trainees. Our concern is that the SRA’s proposals seek to reduce their role as a regulator throughout the qualification process, leaving uncertainty around who ultimately takes responsibility and ownership of the qualifying process for graduates. We will continue to monitor these developments closely to ensure we are best placed to support both graduates and clients in delivering quality and diversity to the progression. Sessions are expected to focus on the implications for access to the profession – including the future development and use of alternative routes to qualification – as well as next steps needed to further improve diversity in the legal sector.